The Facebook search allows you to connect with people who share edges with you. 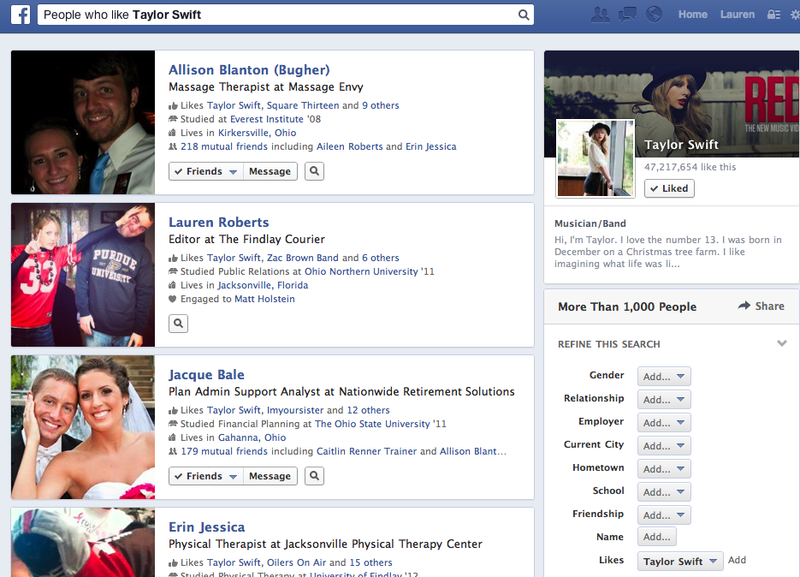 Through Facebook search, I was able to find all other users who liked Taylor Swift. The search feature allows you to take the search a step further by searching for users’ who like Taylor Swift’s employer, current city, etc. Facebook is no longer a site intended for posting arbitrary daily updates, creeping on exes and playing Candy Crush; it’s a tool for making connections. According to Shel Israel, Facebook’s social graph allows you to find people, places, photos and interests based on who you’re friends with. Every time you like something on Facebook, you create a connection to other users who also like that brand, photo or status. These connections are called edges. Edges are critical for marketing because they determine what information is seen. Facebook has developed an algorithm that governs what posts show up on a news feed, and how high on the news feed the posts are displayed. As a brand, it’s crucial to get your posts on a news feed because 88 percent of Facebook users won’t return to a fan page once they’ve hit the like button. The algorithm is based on the sum of edges. EdgeRank is determined by an edge’s affinity, weight and time decay. The more involved interactions a user has with a brand, the higher EdgeRank the brand will have. This is why it is crucial for brands to post engaging content on a consistent basis. The more your fans comment on your posts, the higher your posts will show up in their news feed. Kurt Wagner said the EdgeRank algorithm has led to a 13 percent increase in user engagement and a 5 percent increase in interactions on Facebook. This increase shows that Facebook users want to interact more and be informed by brands that are relevant to them, as opposed to seeing all of their connections’ ranked solely by the time they posted, like Twitter. Do you think Twitter will develop a similar algorithm to keep users engaged? If you want more ways to improve your EdgeRank besides posting relevant content daily, Amy Porterfield and Broadsword Communications suggest posting images and videos, or just straight forwardly asking for what you want. Posting a photo on Facebook will get you 120 percent more engagement, and asking opinion-driven questions will bring you 90 percent more engagement. Most of the time I spend on Facebook is spent looking at pictures. I get far more likes and comments on photos I post, than I get on statuses I post. People feel more engaged by visuals. Last week when I posted that I needed responses for class and asked my Facebook friends which social media site they liked to receive content on, I was shocked by the amount of responses I received. Just by asking people to comment, they felt more engaged and wanted to share their opinions. Facebook’s improvements were sparked by the advancements of Google Plus. The content you create on Google Plus is indexed by Google, and it will show up in Google search results. Steve Rayson said over half of the searches performed in the U.S. occur on Google, so it’s essential that your content can be found on the site. Google Plus authorship also provides you with a higher visual profile in search results. Rayson said that Google likes to give a higher priority to the content that is created on their own site. This led me to wonder about a question that was asked in a post by Brian Clark: Isn’t the point of search engines to point you to the most useful information, no matter what site it’s on? Is Google’s site less helpful or legitimate because it gives higher priority to those who use Google Plus? Whether Google is hurting itself in the long-run or not, it’s evident that currently having a presence on Google Plus is critical for a brand.